We like to stay in touch with our Cathedral/Rice Memorial Alumni and need your current contact information in order to do so. Please fill out our Alumni Contact form to ensure that you will receive all publications including our Alumni Magazine, and information about alumni and school events, class reunions and more. If you have questions for the Rice Alumni Office, please contact Christy Warner Bahrenburg '88 at bahrenburg@rmhsvt.org or 802-862-6521, ext. 200. Ready to organize your class reunion? Check out our tips for getting started. And, let me know when you’re ready to get the word out. I will add your Class Link to our website. The following classes are currently planning reunions. Lucille, Bob, Tess, Roger or Loren. The reunion was a great success! Please stay in touch by contacting Gabrielle Fredericks Hammond at gabehammond@comcast.net or Ken Boyd at bluegrassboy1@comcast.net. To stay in touch with the Class of 1965, contact Joanne (Rock) Varricchione at joannevarr@gmail.com. The Class of 1966 held their 50th reunion on July 22, 23, and 24, 2016. We enjoyed an informal gathering at the Eagles Club on July 22. On Saturday, July 23, some classmates played golf at the Burlington Country Club while other classmates biked the Burlington Bike Path. In the evening, we all enjoyed cocktails and dinner at the Burlington Country Club as we were entertained by a piano player from Chicago throughout the evening. It was great to reconnect with everyone. We ended our reunion on Sunday with a Mass followed by a tour of our newly renovated high school. A great time was had by all! To stay in touch, Diann (LeBlanc) Varricchione at diann.varricchione@uvm.edu. 50th Reunion is scheduled for August 5-7. Festivities include a golf outing, a BBQ at T.Rugg's Tavern, dinner and dancing at the Elks Club, Mass at Christ the King Church, a tour of Rice and lunch at the Olde Northender Pub. For more details, contact Cheryl Demers at cheryldemers@gmail.com. A 50th Reunion celebration is planned for August 10-12. Contact Paul Lafayette at paulvt101@yahoo.com or (802) 355-0028 for more information. Fellow classmates, we need your assistance in making our 50th reunion next summer successful. 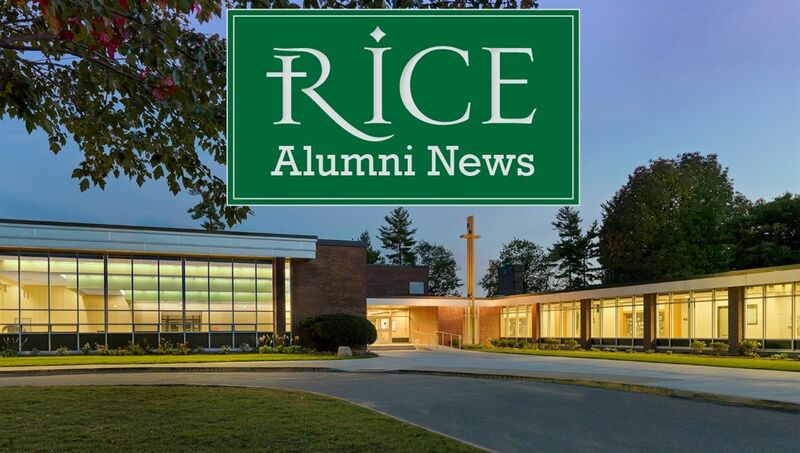 Please help us update our class list by sending your contact info to Pat Blair at ricereunion1969@aol.com or calling her at 802-318-6863. David Clavelle at clavelled@msn.com or 802-310-5586. Help us spread the word. Let's make our 50th reunion something special! The Class of 1972's 45th Reunion is scheduled for September 29 and 30th﻿ and will include a cruise on the Spirit of Ethan Allen at 6pm on Saturday. For more information, contact Gayle Critchlow Gardner at gayle@northcountrytile.net or Mark Galle at mpgalle@gmail.com. Members of the Class of 1973 will gather June 29 and 30th. Details can be found here. RSVP by June 15 to Paulette Bergeron at 41 O’Neil Lane, Williston, VT 05495 or RiceReunion73@gmail.com. It was great to see everyone at our 40th Reunion! The weekend was great! Stay in touch by emailing RiceMHS1983@gmail.com or join our Facebook page, Rice Memorial High School Class of 1983 - Little Indians for Life! 30th Reunion is scheduled for August 4-6, 2017. Reunion events include a wine tasting, tour of Rice, Spirit of Ethan Allen dinner cruise and Mass at SMC. To register, click here. The Class of 1988 is invited to EB Strong's (10 Church Street, Burlington) on Friday, June 22 from 7-10pm for light appetizers and cocktails (cash bar). Classmates are encouraged to continue the celebration at the All School Reunion at Rice on Saturday, June 23. Contact Robbi Handy Holmes for more information at 802-881-8193 or robbihandyholmes@gmail.com. 25th Reunion is scheduled for Labor Day weekend. Contact Jennifer Varrichione Pizzagalli for details. A 20th Reunion celebration for both classes will be held at Higher Ground in South Burlington on July 22. Buy your tickets here. Contact Stephanie Pascarella for more information. Join the Class of 2001 Facebook page - "RMHS Class of 2001"
Click here to read the latest issue of our Alumni e-Newsletter! We want to feature more news of Rice alumni making their way in the world. Please submit this form to stay in touch and share your good news. How did your Rice experience impact you? Do you have a favorite Rice moment, class or teacher? If so, tell us about it here. Don't forget to contact us when you move or have news to share. For further details, email Christy Warner Bahrenburg '88 at bahrenburg@rmhsvt.org. Stay connected with your Rice classmates by adding Rice to your LinkedIn profile and following us on Facebook.